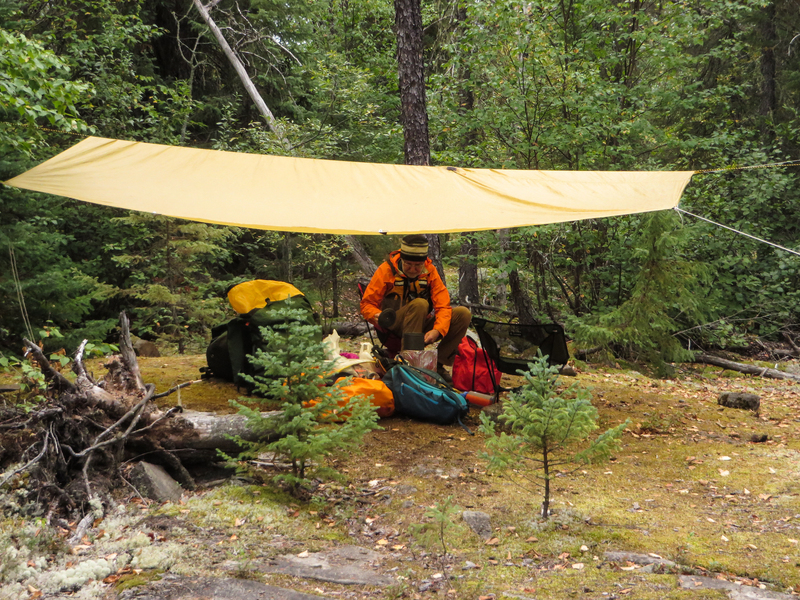 The 14′ x 10′ tarp above our tent meant that we were able to take our tent down in the rain and then have it provide a dry spot while we had breakfast. Luckily the rain was light and, after we had loaded the canoe and pushed off, it mostly stopped. We would get an overcast day with occasional brief periods of drizzle and showers while we headed south on the lake. 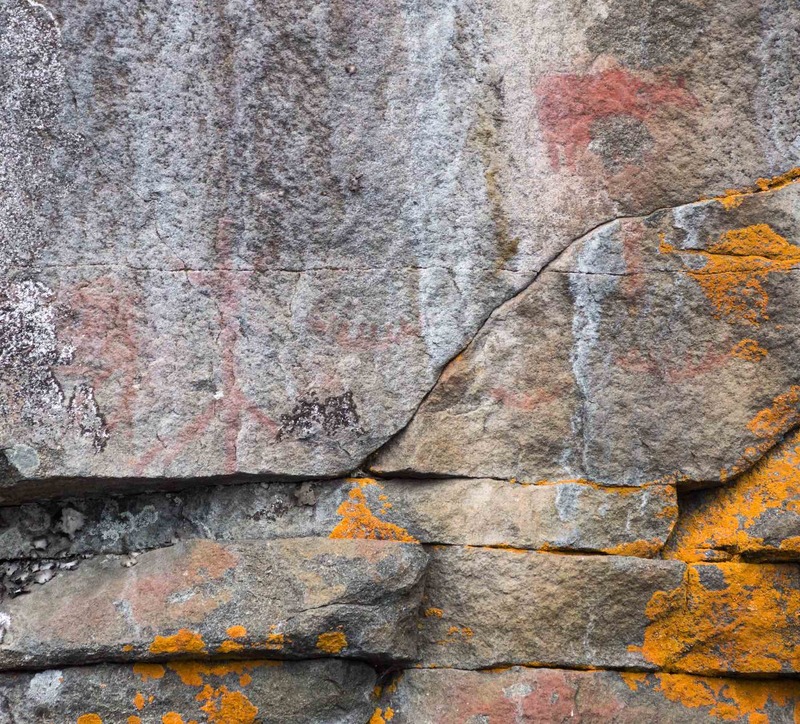 Our initial goal was to revisit the other four pictograph sites and then set up camp closer to the south end of the lake by noon and call it an early and easy day. 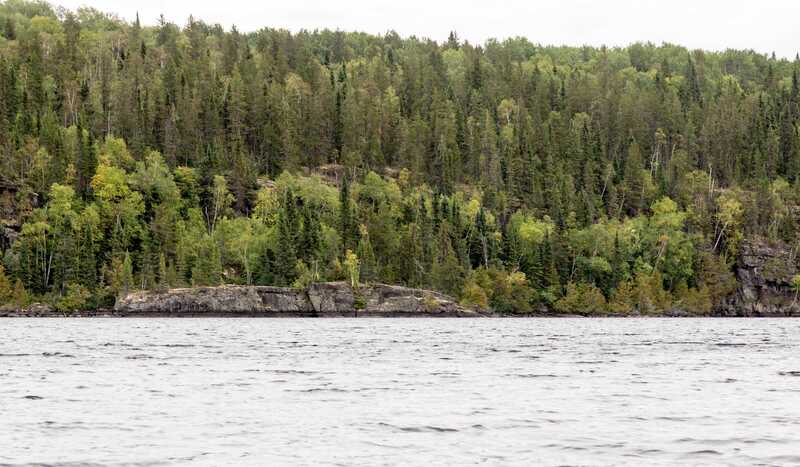 First, we headed back to the site labelled #264 by Dewdney and parked the canoe at the south (i.e. 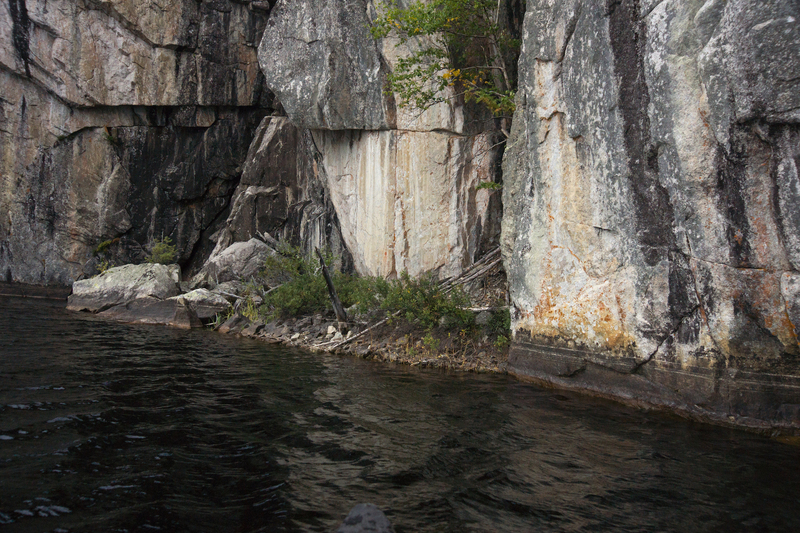 left) end of the stretch rock face you see in the image below. There is a trail that runs along the top of the cliff for a couple of hundred meters and some fine views can be had. 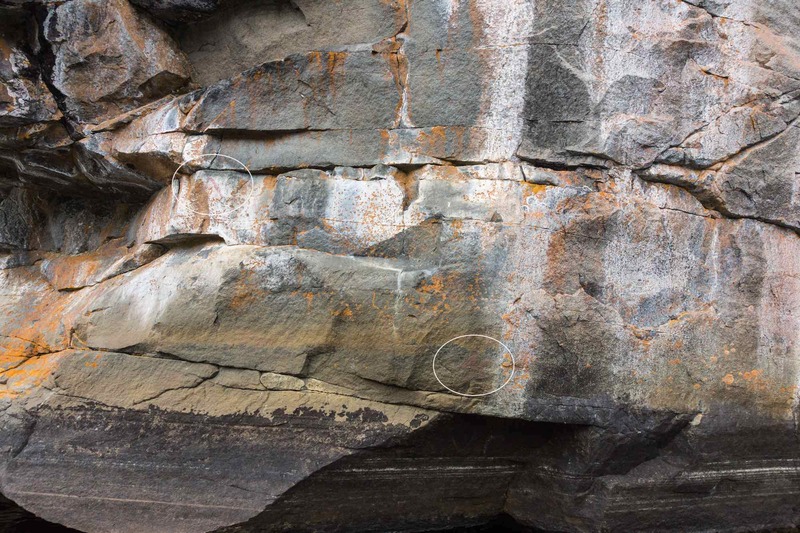 One of the landmarks you will find up there is the erratic rock perched dramatically on the edge of the cliff near the south end. Walk a bit further and you will come across a log bench fashioned by some keen visitor. 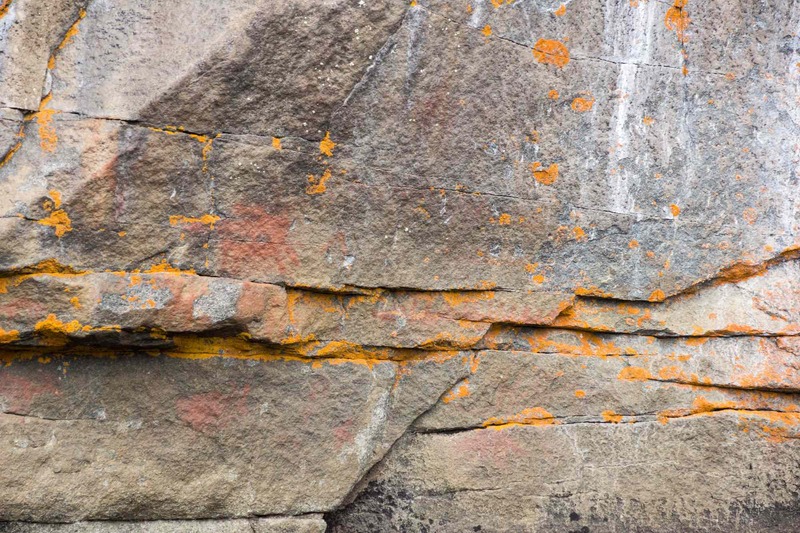 It is about fifty feet (15 meters) from the cliff edge down to the water. We spent a half-hour rambling around up top of site #264 and then continued our paddle down to the south end of the lake, passing again site #263 and the potential campsite across from it. 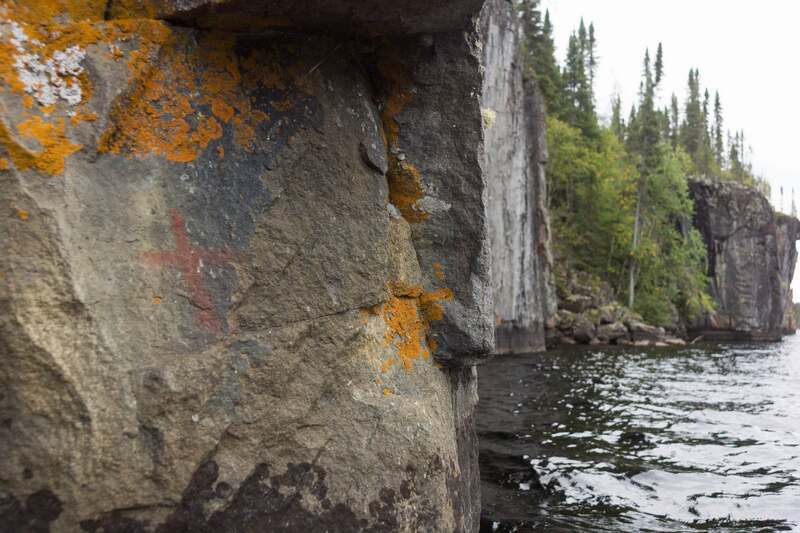 Then we paddled across to the east side of the lake so we could see again the pictograph site which Dewdney labelled #221. From the east side, Max pointed his camera back at the third of the four west-side sites for an overview image you see above. 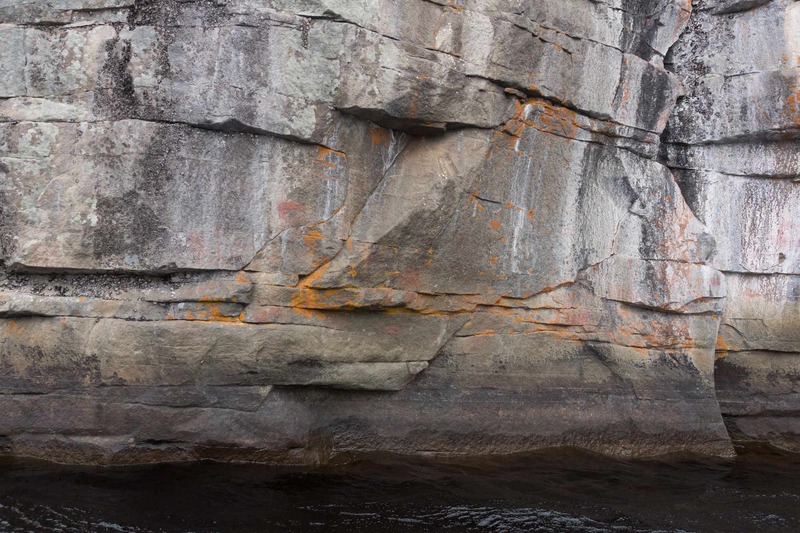 the zigzag line on the right, which brings to mind Mishiginebig, the two-headed snake of Anishinaabe myth if the two lines above the crack in the rock belong to the part below. 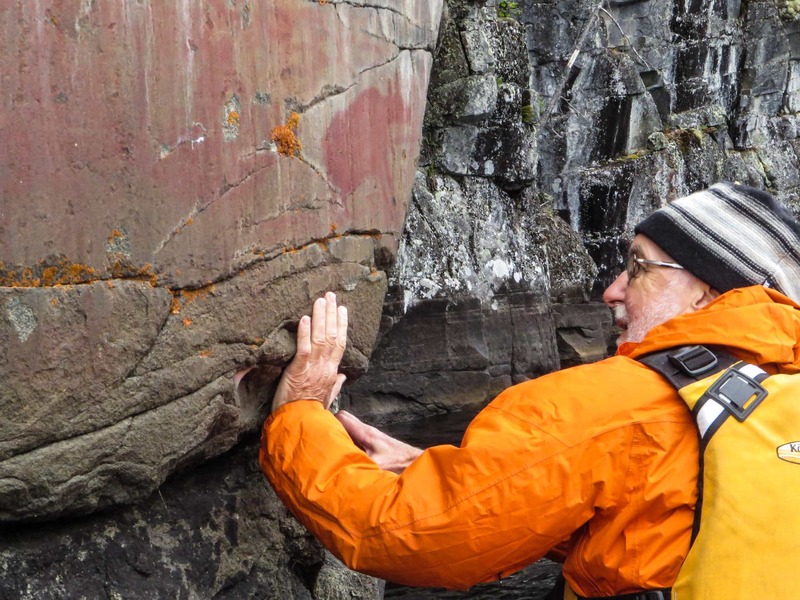 As we paddled down the rock face from the north end, we would see nothing but smudges and impossible-to-determine shapes. 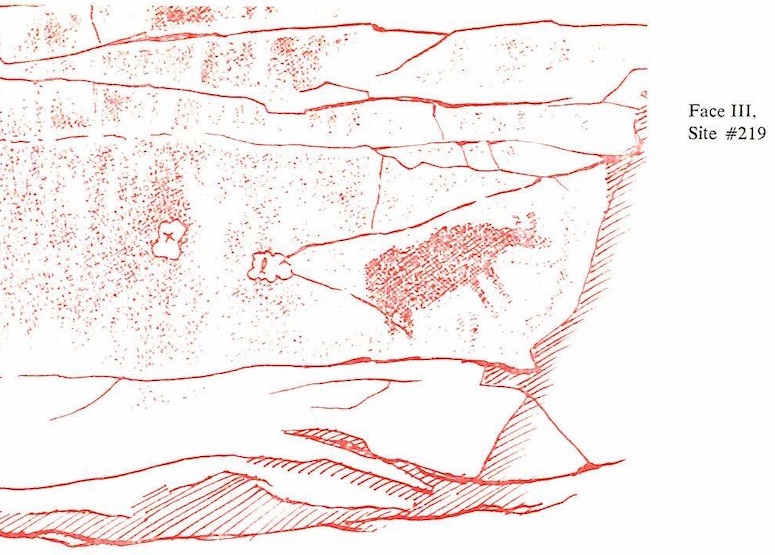 The one below may be the one which appears on the Dewdney drawing which follows – or maybe not! 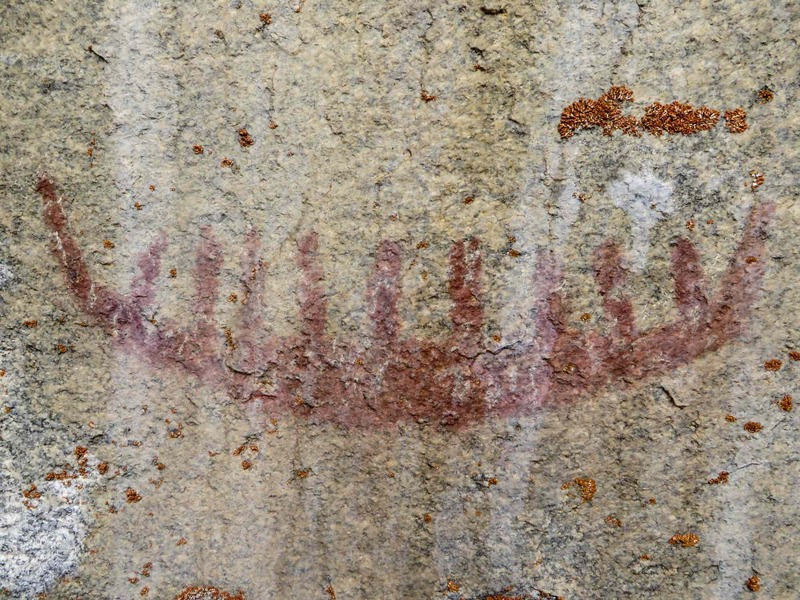 We got excited when we saw what we had called The Hand pictograph again. The three – or was it four? 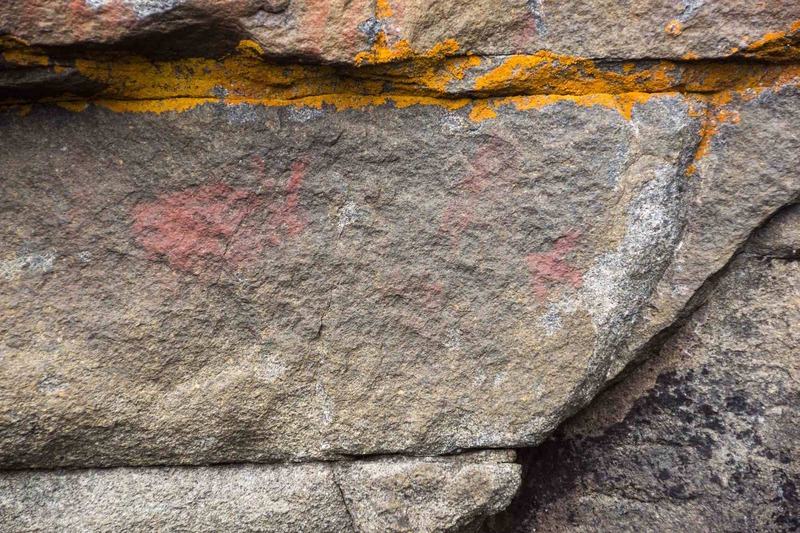 – fingers should have been a clue that back in 2013 we had mistaken streaks of red granite for a pictograph. This time it seemed pretty obvious that we had misread it! 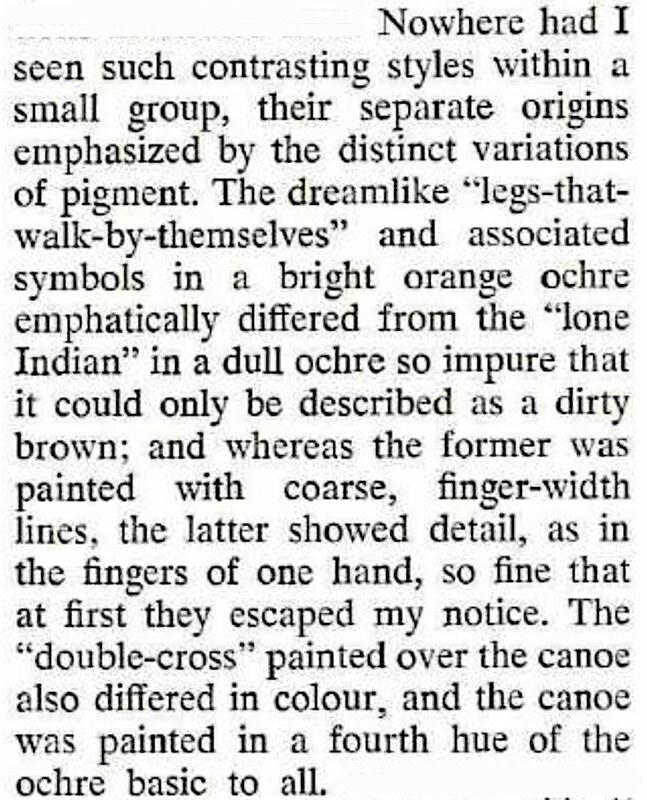 That might also explain why Dewdney made no mention of it in his brief write-up of this site! 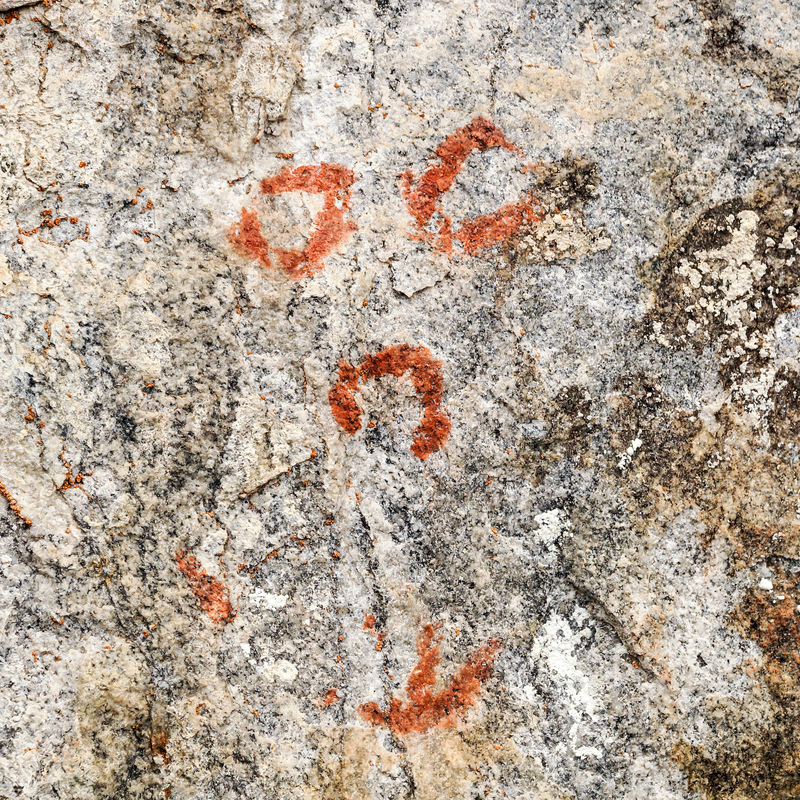 Cliff Lake’s top (i.e., northernmost) four sites present very little in the way of pictographs for a visitor to ooh and aah over. 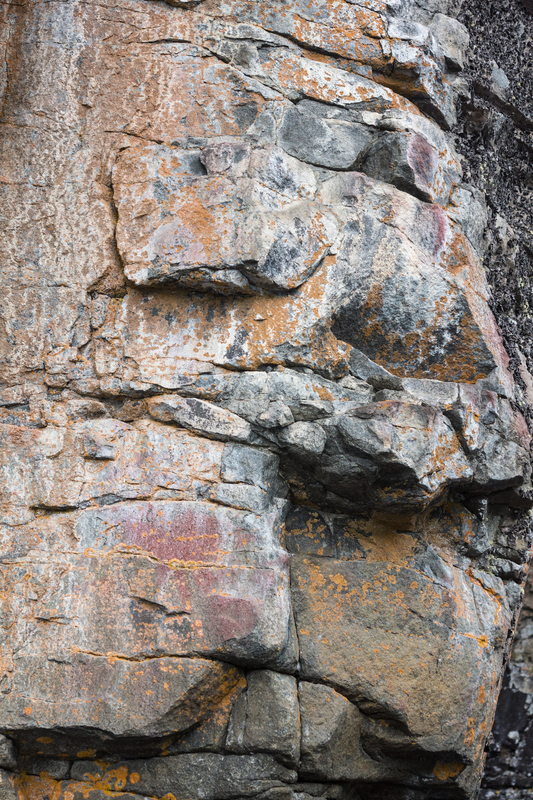 It is not until you get to Site #219 that you see anything that elicits a sense of wonder and real appreciation. 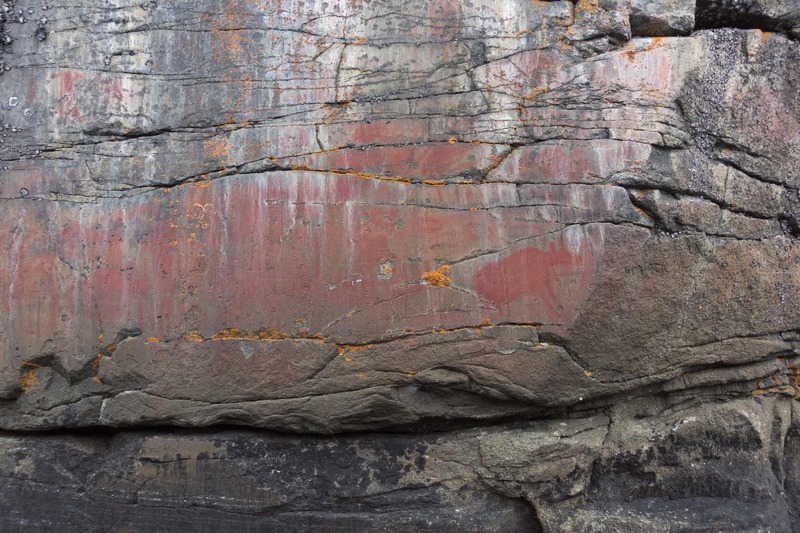 We now paddled over the east side and Site #219 to see the single-most striking panel of ochre paint at Cliff Lake – the one featuring The Moose! 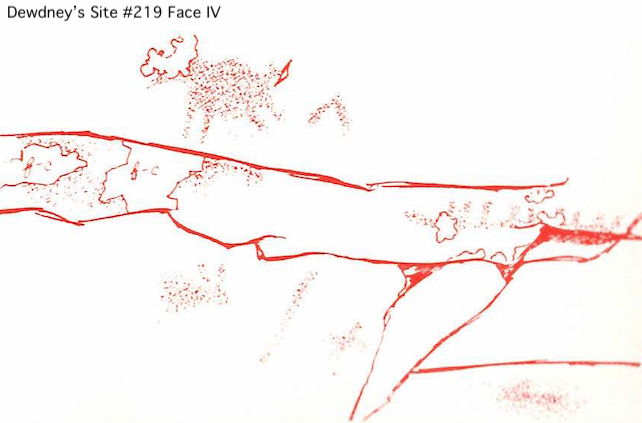 the northernmost of Cliff Lake’s Site #219 pictographs – Dewdney’s Face I? 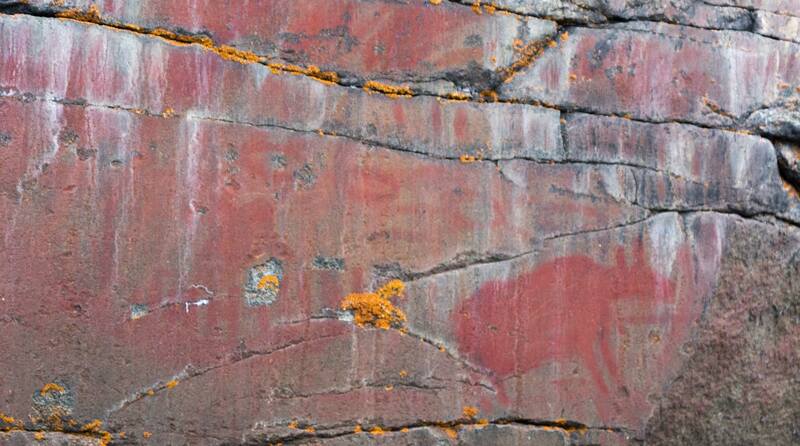 The image below conveys the actual size of the Moose pictograph. It is perhaps 25 cm. long and 10 cm. high. 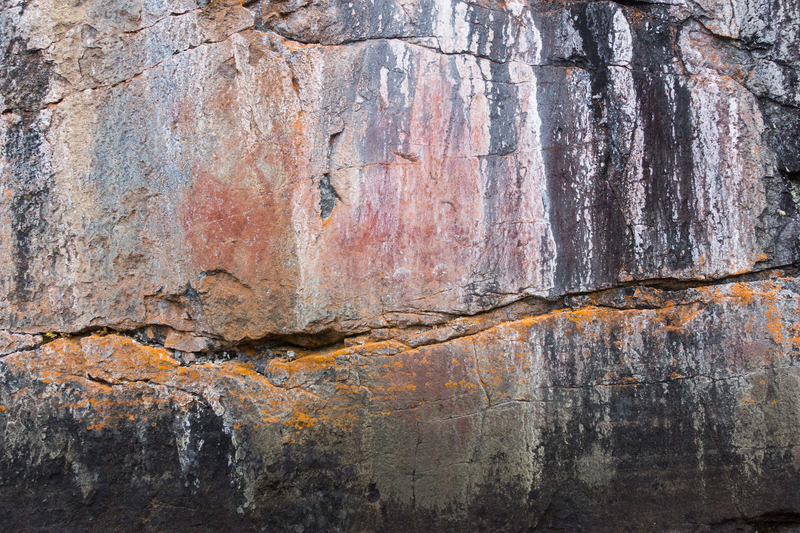 What is noteworthy is the amount of ochre dedicated to creating a very vibrant and solid rendition of the animal. 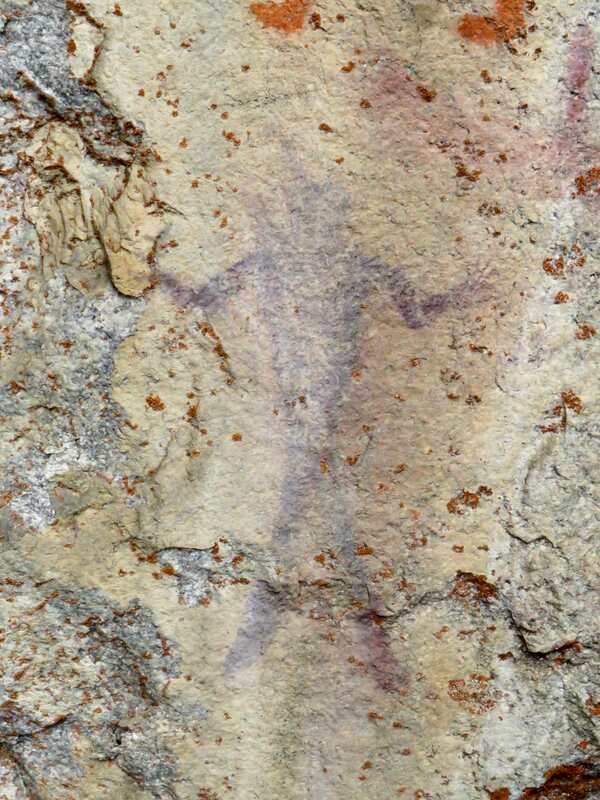 Most rock paintings are a finger or two wide and maybe 10 cm. long. Images like The Moose definitely stand out from the norm. 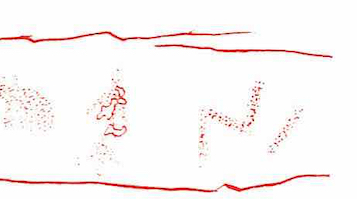 To the left of the Moose image is a canoe with a number of paddlers in it; above both images is a series of circles and above those some vertical lines. From further away it mostly looks like a badly faded collection of smudges. 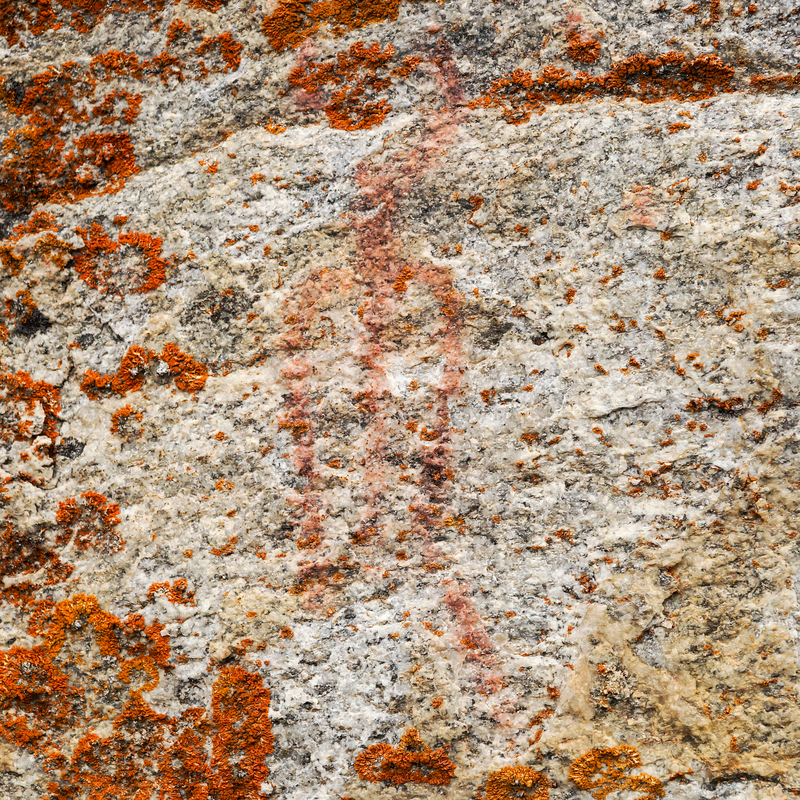 One of the last pictographs at Site #219 is the one in the image below, that of a cross. 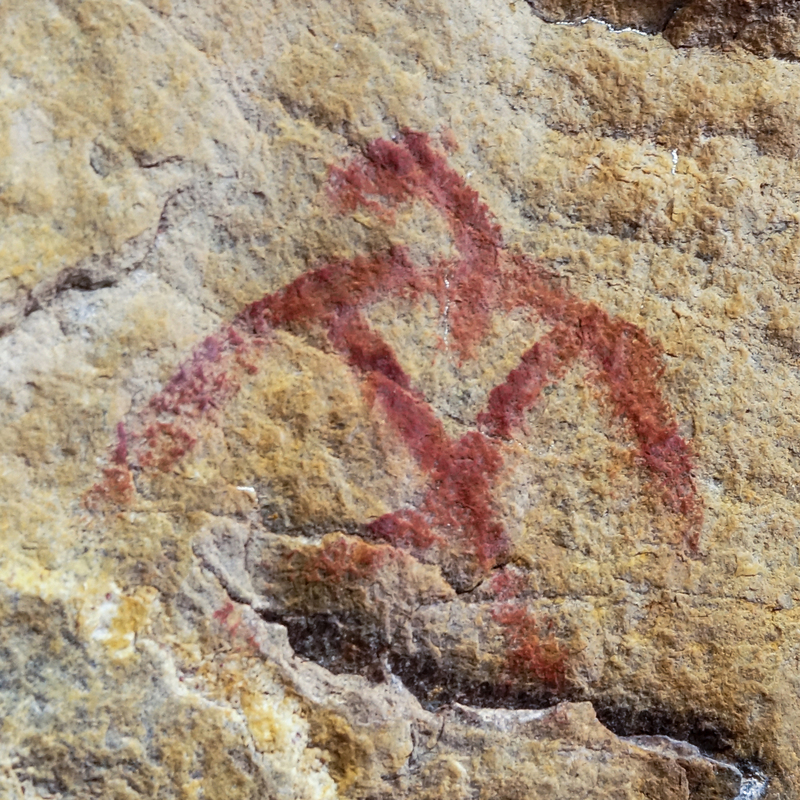 Interpretations range from the obvious “It is the Christian cross” to “It represents the highest degree of attainment in the Midewiwin” – i.e. 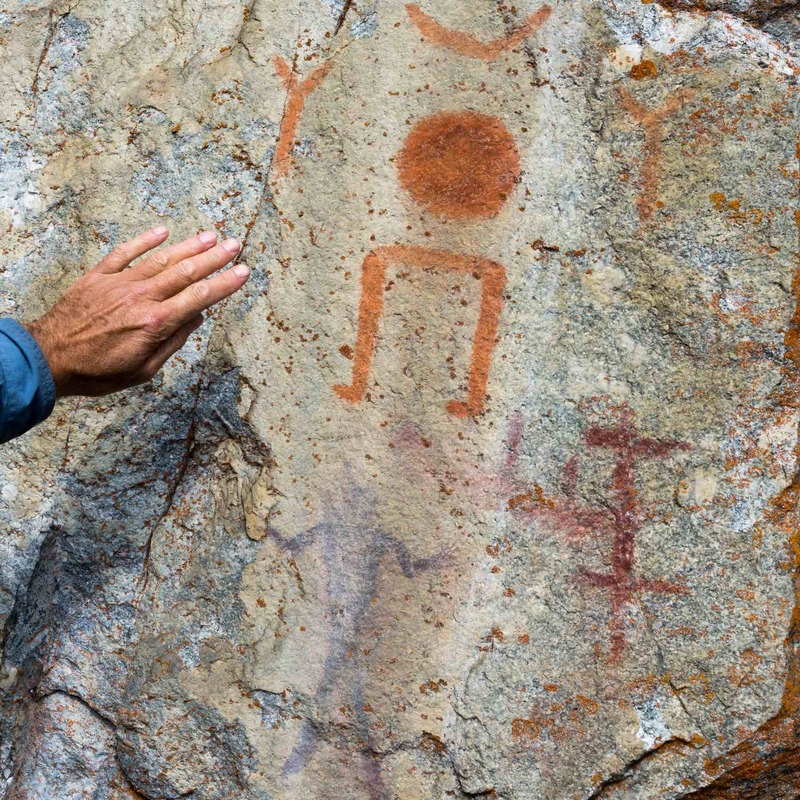 the closed society of shamanistic practitioners in traditional Ojibwe society. 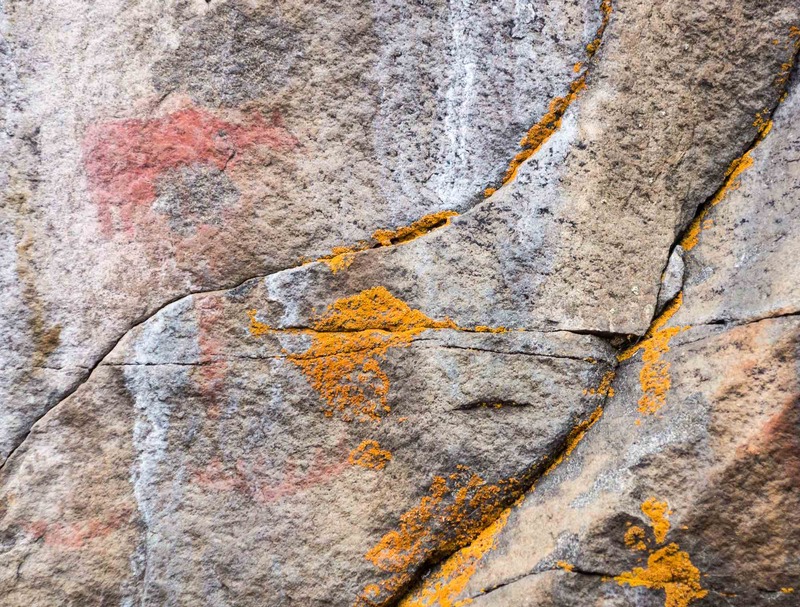 The cross image found at the Collins Inlet pictograph site on Georgian Bay prompts the same discussion as to its meaning. 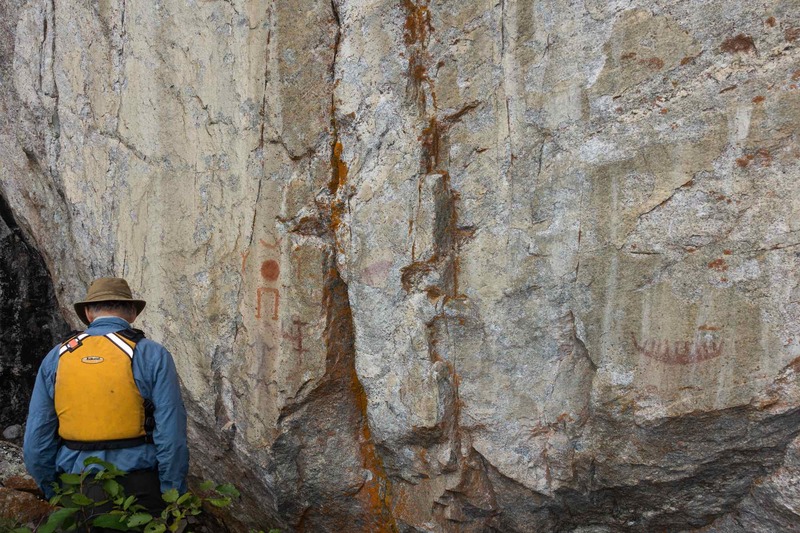 We moved on from Site #219 and headed for the last of the rock painting galleries on the lake. While the plan had been to find a good camping spot somewhere in the vicinity so far nothing had really fit the bill. A half hour later we had to conclude that there really were not many great tent sites on the lake and that our site at the north end of the lake was the best of a very limited selection. 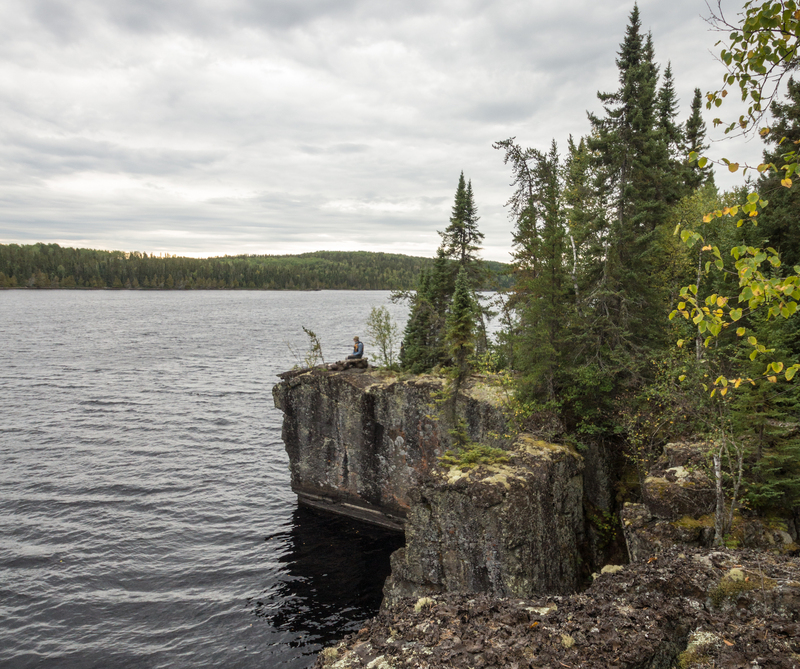 So much for an entire post on The Top Five Campsite Choices On the Pikitigushi’s Cliff Lake! 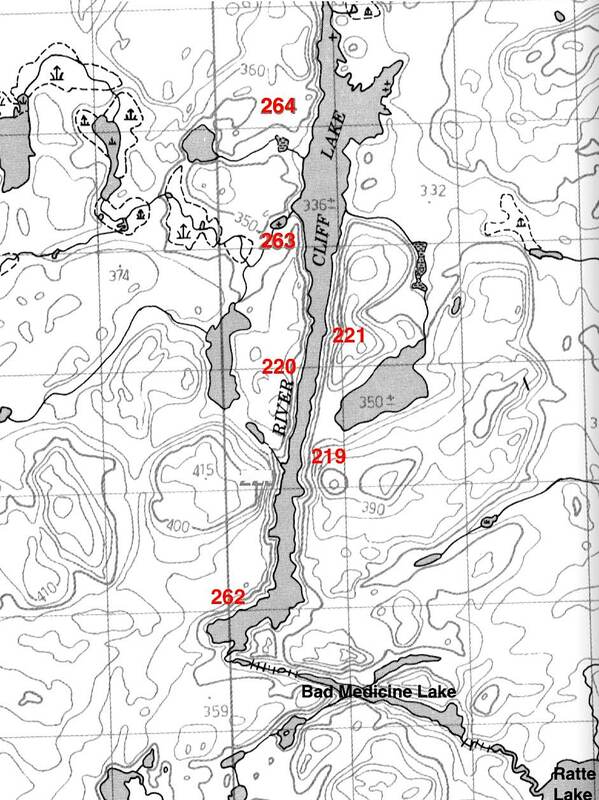 Around the point on the west side of the lake as pictured in the image above and we approaching Site #262, which surpasses #219 in the number of strong and clear – even if puzzling – images. The Thunderbird image was the first we paddled by as we approached the core of the site, which is different than the others in that it is accessible on foot. 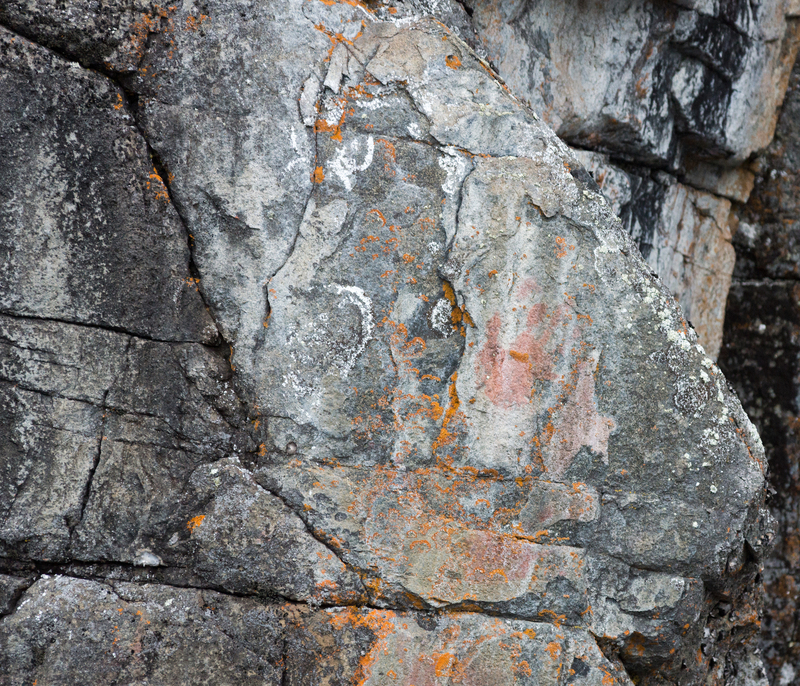 You can see the Thunderbird on the left side of the image below – strong, clear lines create a simple but effective image of the being known as Animikii. 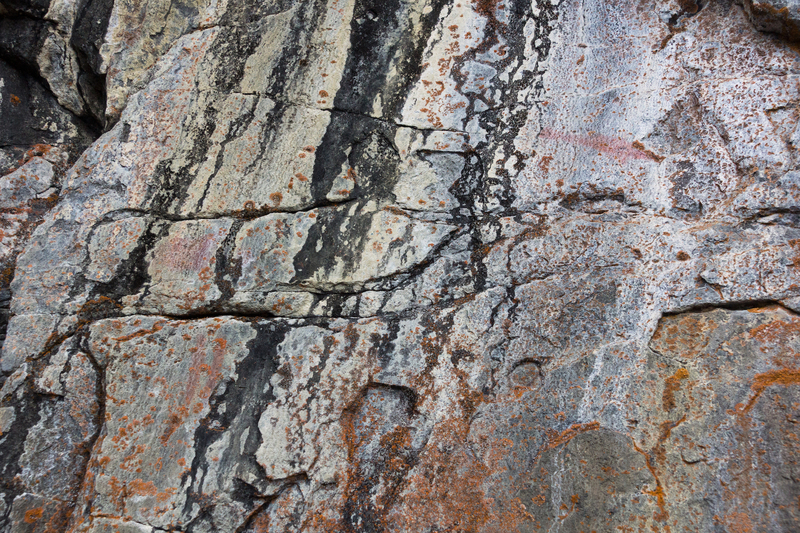 Scroll down a few images to see a close-up! And there was the core of the site! 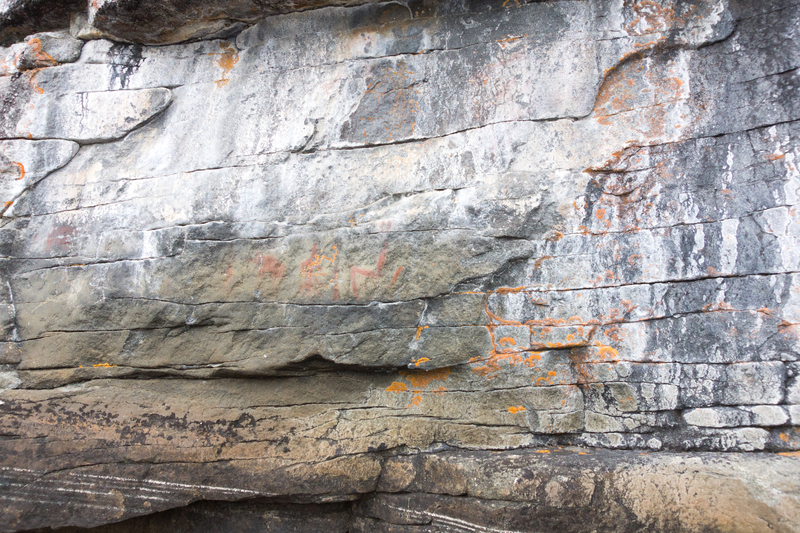 We beached the canoe and stepped ashore and then spent some time getting a fresh collection of photos of the rock paintings to add to those we had taken on our 2013 visit. 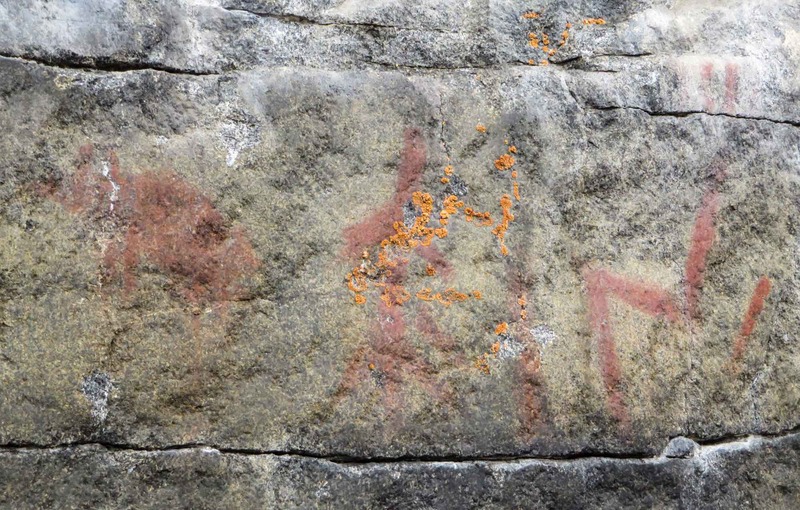 The next half-dozen images show the various rock paintings that Dewdney is referring to in the above quote. This time I made sure to get a good shot of what he refers to as the dark brown “lone Indian” image. However, we still have no idea how both of us missed seeing the panel with the three open circles and the broken canoe at the bottom. I’ve included a photo we took on our previous visit! The colour variation from image to image is noticeable in the panel below! 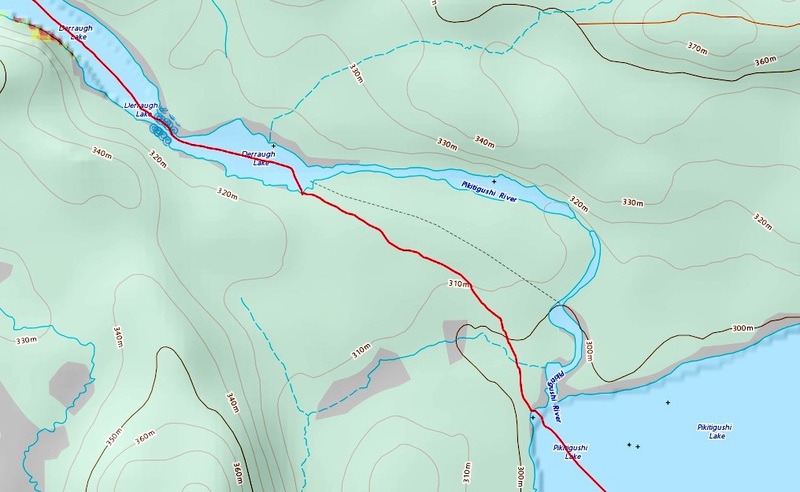 By now our plan to spend a second night on the lake was down to one possibility – a campsite at the start of the portages that lead to Ratte Lake. Not seeing anything suitable, we decided to push on. The map below shows the series of three carries that take you from Cliff Lake to Ratte. 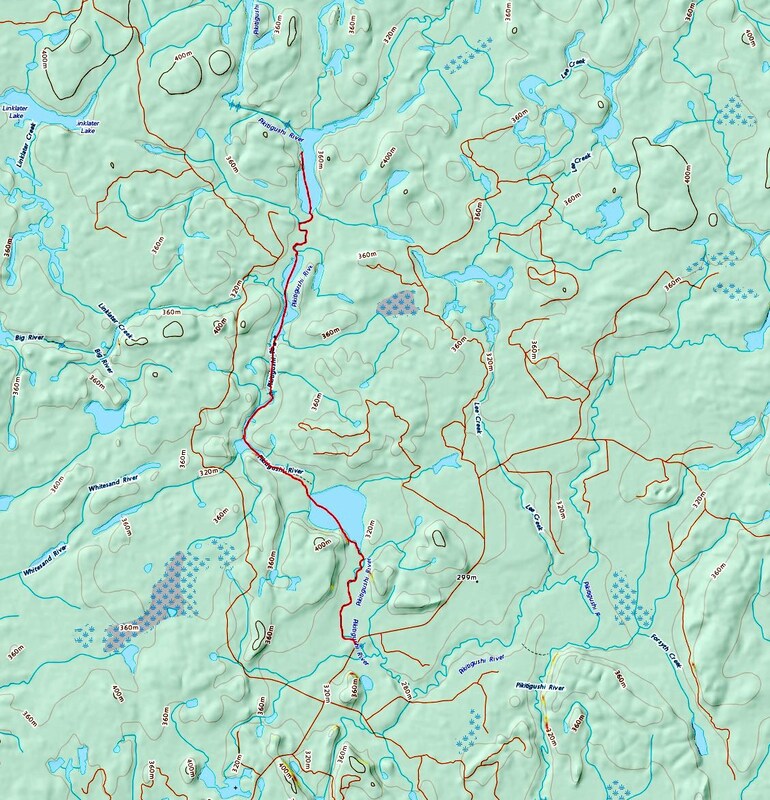 A short 90-meter portage to a puddle that we paddled across and then the 525-meter haul into Bad Medicine Lake. Five years ago we did the portage after 300 km. of tripping – we were in shape and our food pack was almost down to zero. This time we were doing the carry on Day 2 and had sixty pounds (28 kg.) of food. We definitely felt the difference! 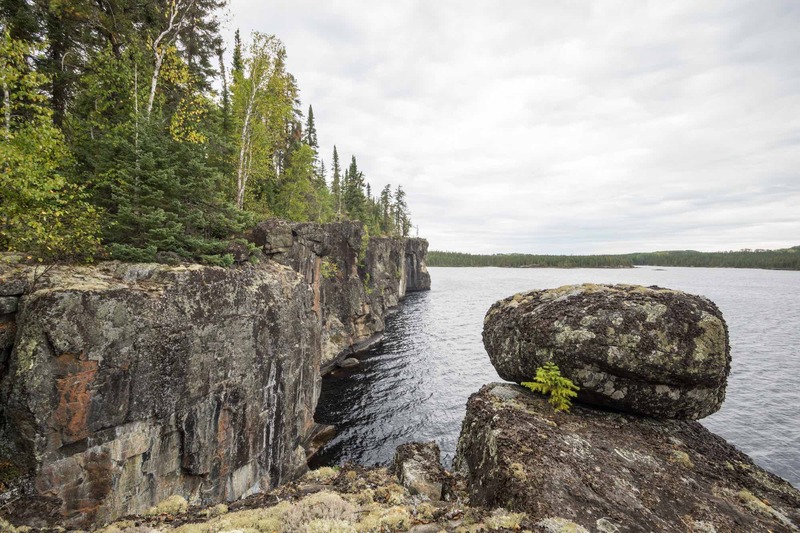 Bad Medicine Lake – the very name makes me wonder if there is a connection between it and Cliff Lake as a major destination for Anishinaabe shamans and vision questers. 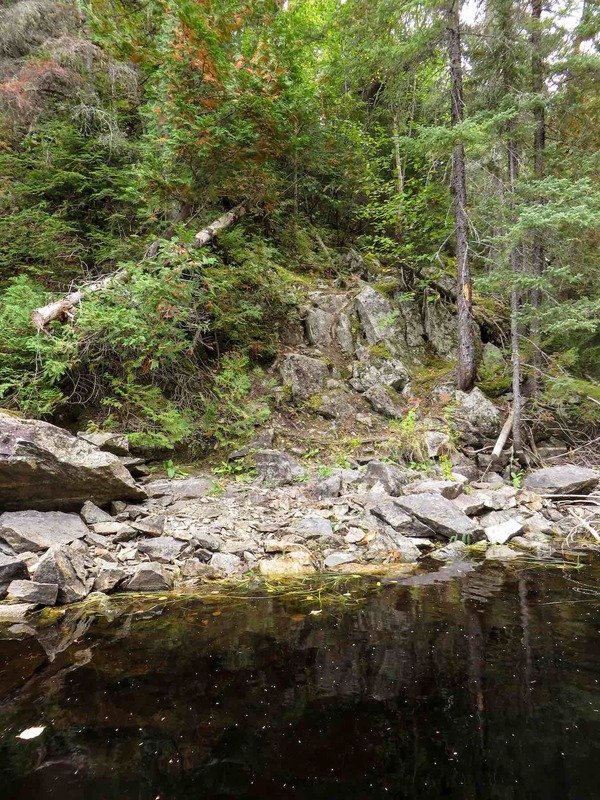 At the end of the carry into Bad Medicine, we got to the put-in at the foot that the three-meter drop to the shore pictured in the image below. 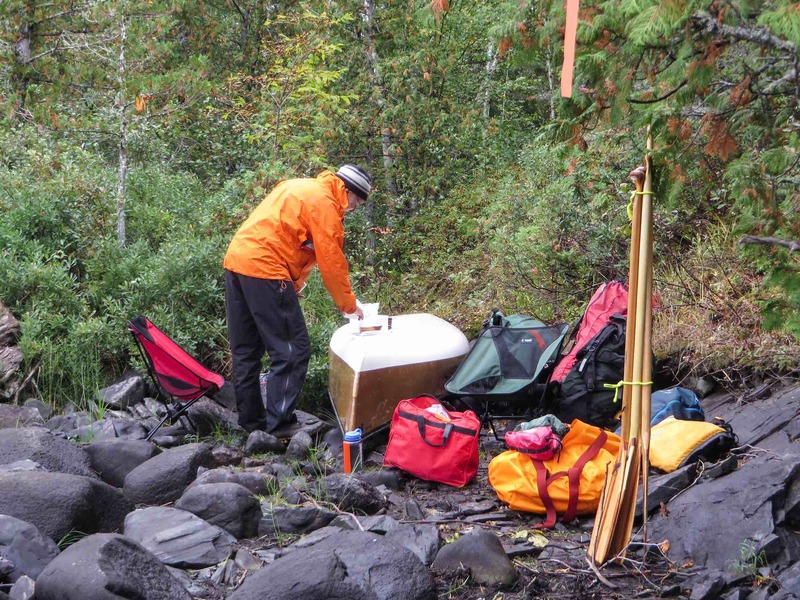 And, as we had the last time, we stopped for lunch on top of the drop, setting up the tarp thanks to a thirty-minute shower that coincided with our arrival. 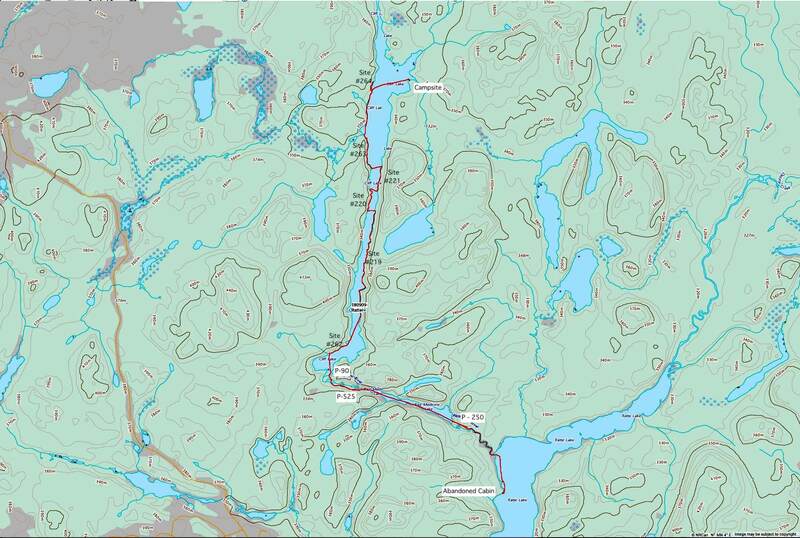 Lunch done, we loaded the canoe and paddled down to the portage at the east end of the lake, the one which would take us into Ratte Lake. (I’d been saying Ra tay for years; the locals pronounce it Ratty with a hard e sound.) 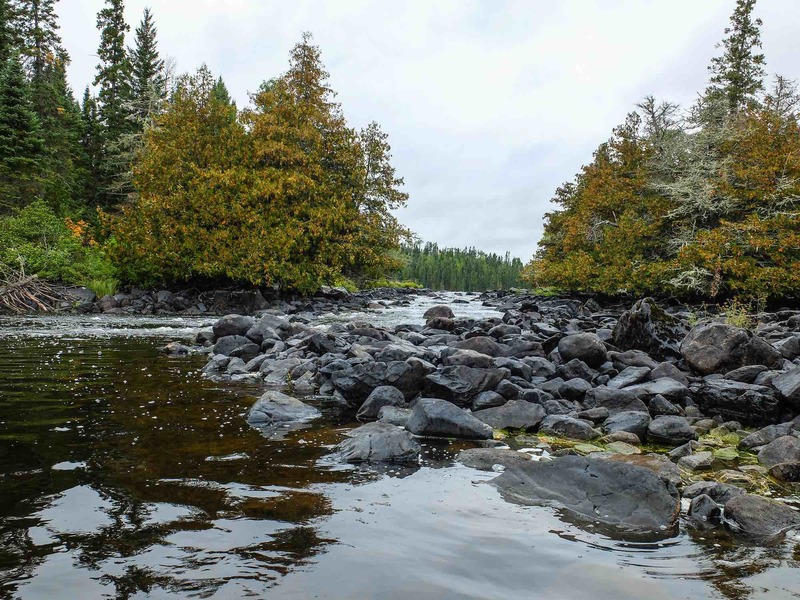 The wind had picked up; it was blowing strongly from the south and we would feel its full force as soon as we entered Ratte Lake from the relative shelter of the narrow river stretch above it. The wind and the waves that were rolling up the lake were bad enough that we soon decided to pull into a somewhat sheltered bay. Switching into “campsite search” mode, we beached the canoe and walked along the shore, noting a couple of decent spots that would do. Continuing our walk along the bay’s sandy shore, we rounded the corner to see what that boat shell was doing there. That is when we saw the cabin, the door open. We had found our camping spot for the night! It has an abandoned look and while it is still in decent shape, the roof needs some maintenance, as does the door, which does not close properly. The various tallies of fish catches left by fishermen who had stayed in the cabin seemed to end around 2008. We spent a bit of time tidying up the interior and were happy not to find any mouse droppings. When we left the next morning, we pried a 2’x4′ against the door handle to jam the door shut. It had probably been damaged by an earlier passer-by in his attempt to gain access. It rained some more overnight and the temperature had noticeably dropped. We were regretting the decision to leave our Primaloft jackets behind – all to save 1 kilogram of weight. It would get even colder in the evenings to come! time: 9:10 a.m to 5:10 p.m. Note: This day was done in total “git ‘er dun” mode. We took all of three photos and made no notes on the portages and lining we did. The fact that we had done this stretch of river before may have something to do with it; the crappy weather did not help! 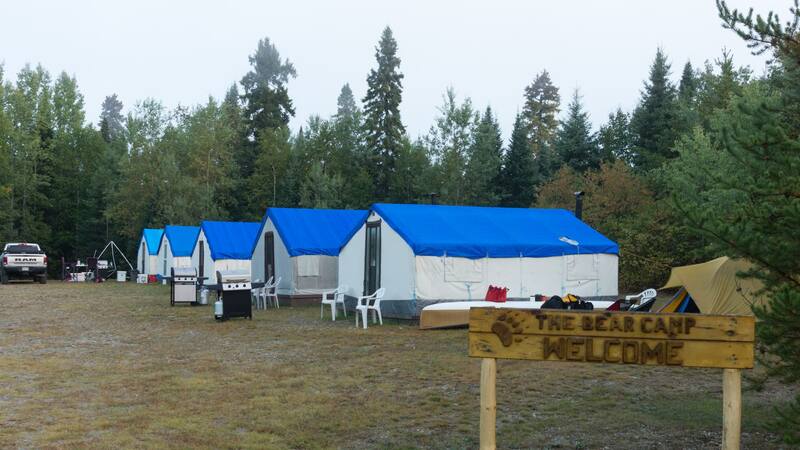 We had a simple goal for the day – get to the Bear Camp situated on the north side of the logging road which crosses the Pikitigushi River. 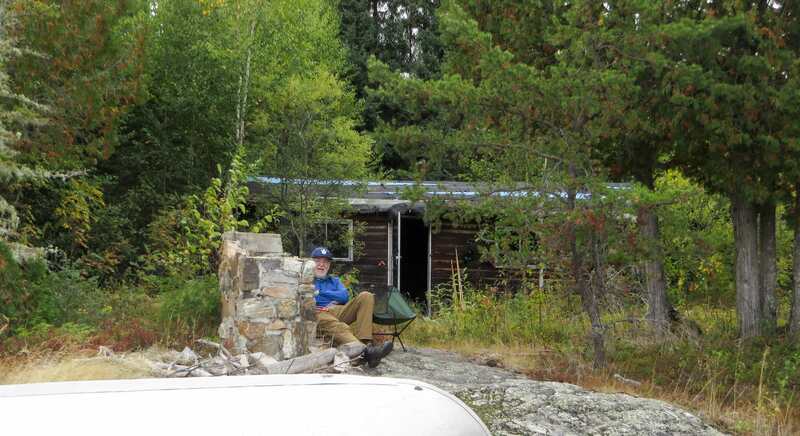 The wind had died down somewhat but it was still drizzling a bit as we left our plush Ratte Lake cabin stop around 9:15. By 10:45 we were approaching the set of rapids between Gort Lake and Wash Lake and spent about ten minutes lining our way down and into Wash Lake. A half-hour later we were at the south end of Wash Lake getting another look at the airplane shell before dealing with our second set of rapids of the day. 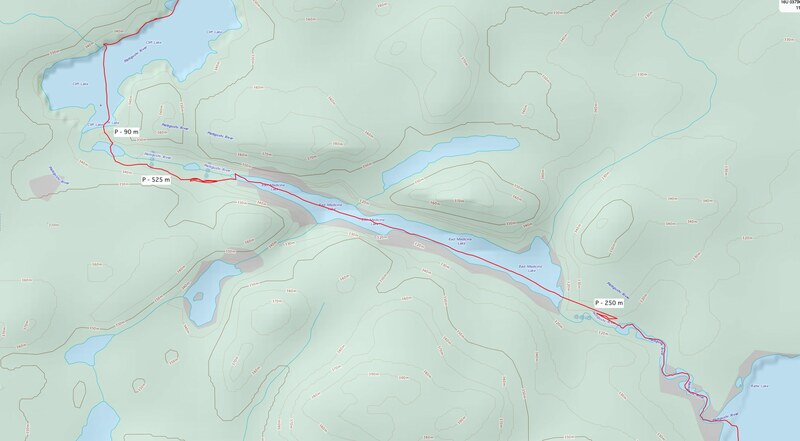 A 150-meter carry that took us about 30 minutes and we were into Derraugh Lake. 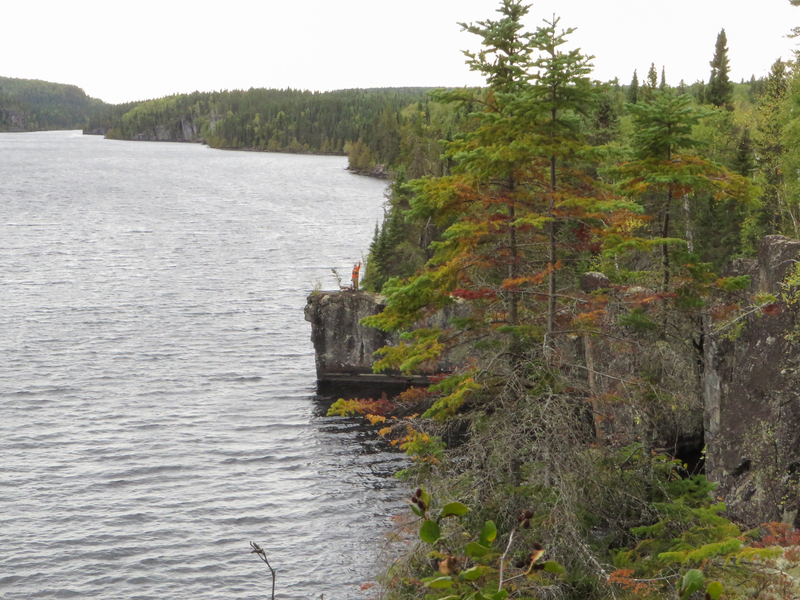 By 12:45 we were at the take-out point for the 1300-meter portage into Pikitigushi Lake. We would fortify ourselves with lunch and a mug of coffee before taking on the carry! 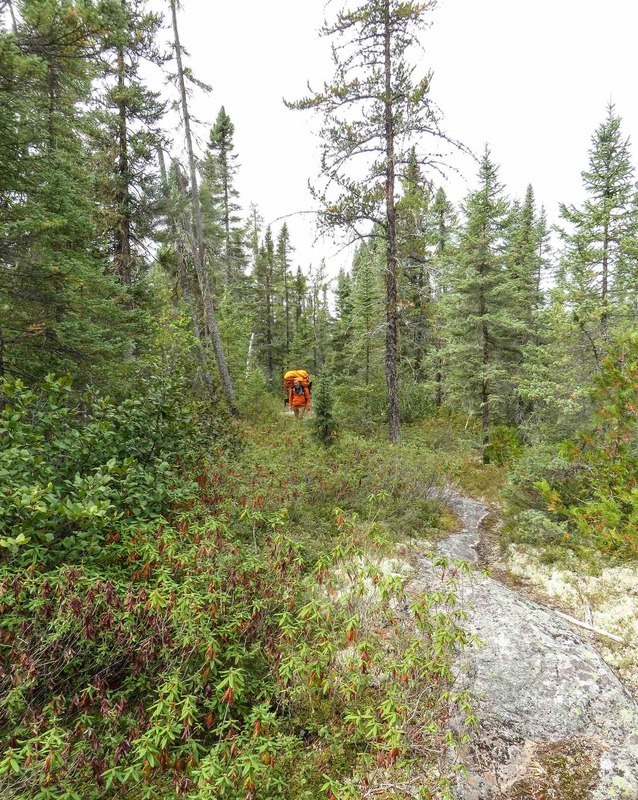 Thanks to the Wabakimi Project trail crew, the portage had been worked on in 2014 and was in better shape than the trail we remembered from the year before that. 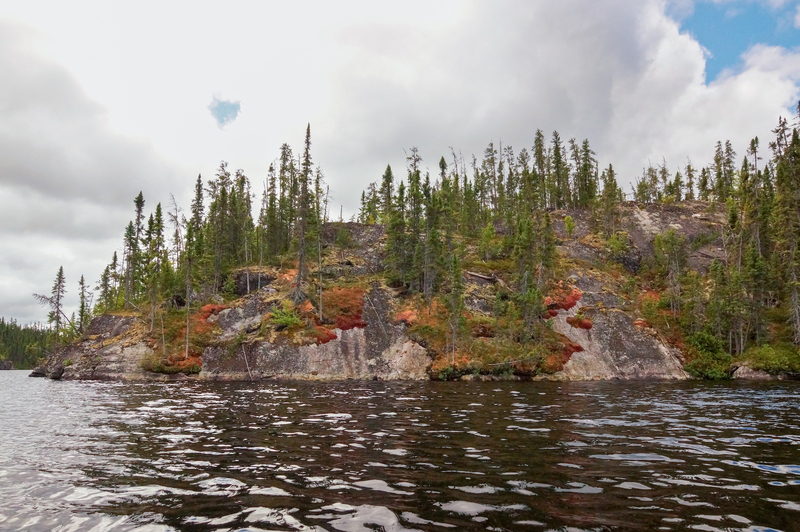 This time we spent two hours on the 1300-meter (one mile) portage, moving gear along in three or four hundred meter segments until we finally got to the shore of Pikitigushi Lake. 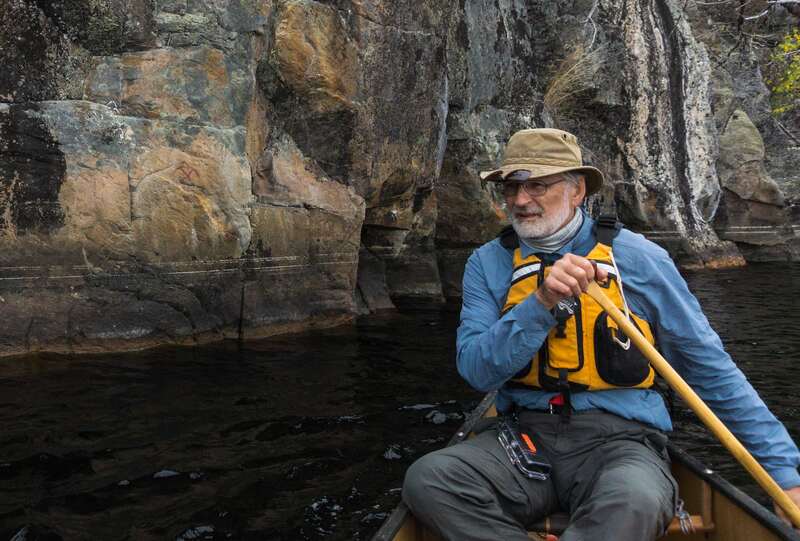 From there it was an easy paddle down to the Boucher Bear Camp and by 5:30 our tent was up and we were enjoying the hospitality of the Boucher Brothers. 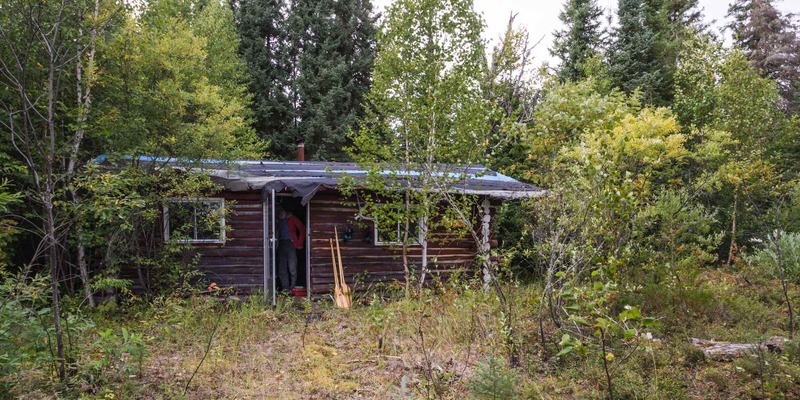 From mid-August to late September the Boucher Brothers – Barry and Duane – run a hunting camp on the shores of the Pikitigushi just off the logging road. Barry drove his truck down to the river where we loaded our four bags for the easy ride back to our tent spot for the night. A great way to end the day – and definitely appreciated! 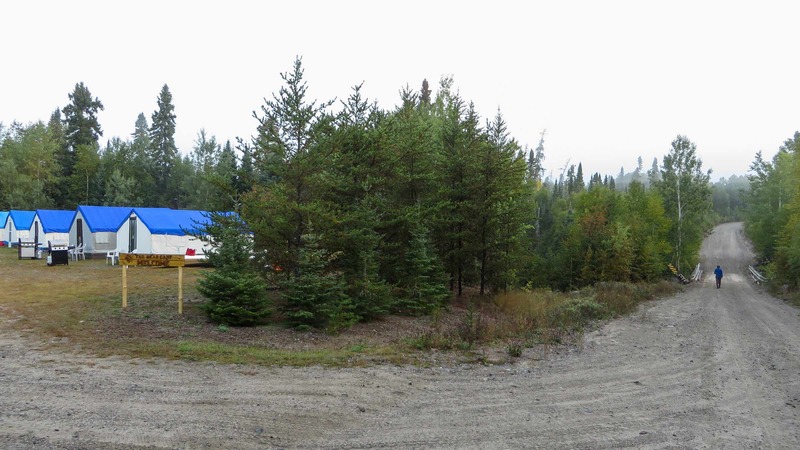 Running past the camp is a gravel road that comes from Armstrong Station and crosses the river just south of the camp. Duane mentioned that the road now goes all the way to Ferland, a VIA stop on the CN tracks just east of Mud River. 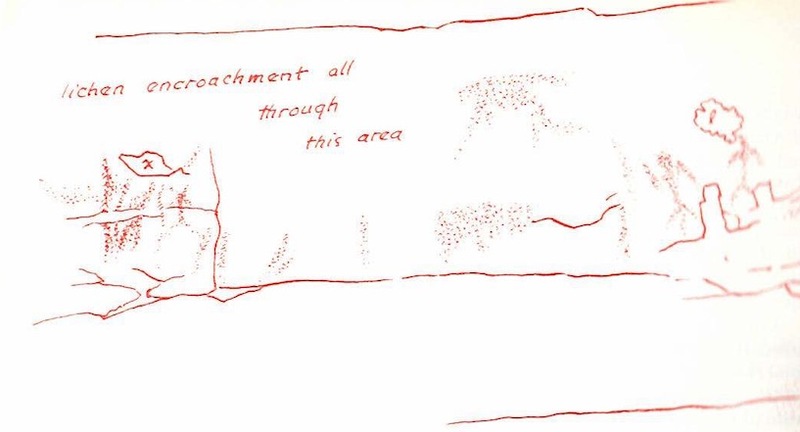 A bit of googling turned up this map from the Stockport Exploration website. 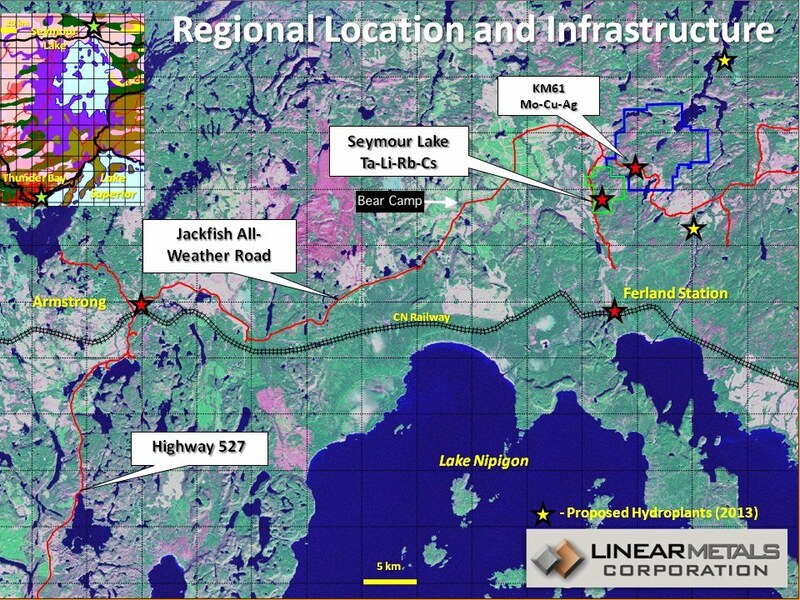 It shows the road from Armstrong going to their property in the Seymour Lake area just north of Ferland Station where it connects with another road system probably meant to service the Little Jackfish River hydro dam and the Ogoki River diversion. It gets you to thinking about all the changes the area has seen since the year 1900. 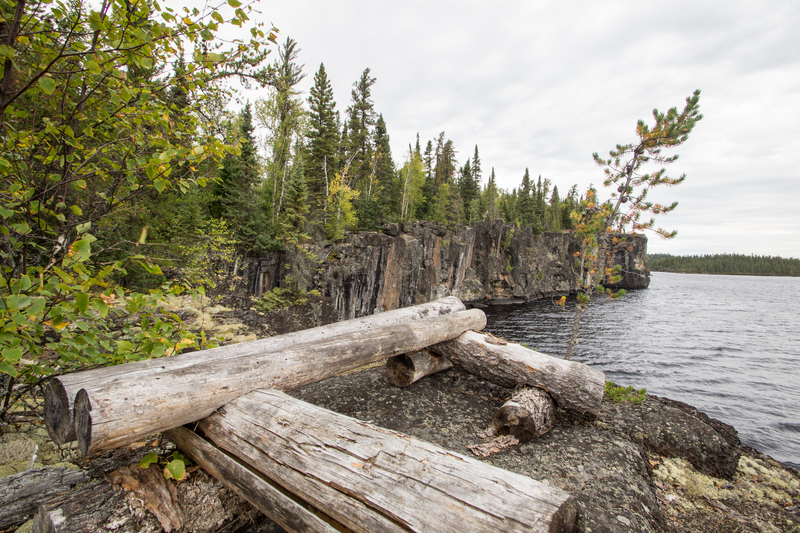 This is not the Lake Nipigon Forest area of 125 years ago! 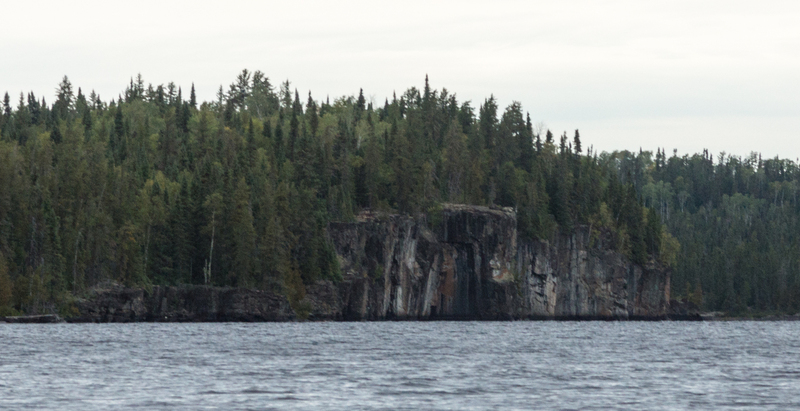 Next Post: Down The Pikitigushi From Cliff Lake To Lake Nipigon – Days 4, 5, & 6.